PORT OF BALTIMORE: In 2017, it 11 percent more container that in 2016. The port of Baltimore handled over 10 million tons of general cargo for the second consecutive year. The port recently welcomed six new rubber-tired gantry yard cranes to help with its container growth. The Port of Baltimore has seen double-digit container growth since 2016. 2017 was a record year of business for the Helen Delich Bentley Port of Baltimore’s state-owned public marine terminals. The port handled more containers and autos than any time in its history. The port also set a new record by handling 10.7 million tons of general cargo from its public marine terminals, the second consecutive year for more than 10 million tons of general cargo. General cargo includes autos and light trucks, containers, roll on/roll off (farm, mining and construction equipment), forest products (rolled paper and wood pulp) and breakbulk cargo. The port recently welcomed six new rubber-tired gantry yard cranes to help with its container growth. The cranes were purchased by Ports America Chesapeake, which operates the Port’s Seagirt container terminal. The total cost for the six RTG cranes was $12 million and each one weighs 325,500 pounds. Since 2016, when the Port of Baltimore welcomed its first big container ship to travel through the newly widened Panama Canal, the port has seen double-digit container growth. In 2017, the Port of Baltimore handled 596,972 containers, an 11-percent increase over its previous record of 538,567 set in 2016. The port was recently named the fourth fastest-growing port in North America and has been recognized as one of the most efficient container ports in the United States for the past three years. 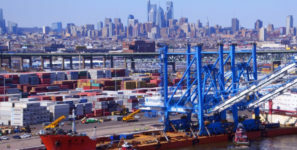 Last year the MDOT MPA announced the purchase of 70 acres of land adjacent to the Seagirt container terminal to handle its additional container business as well as other cargo-handling opportunities. It was the first purchase of land in that capacity in 30 years. Baltimore’s port is ranked as the top among all US ports for handling autos and light trucks, farm and construction machinery, and imported sugar. Overall Baltimore is ranked ninth for the total dollar value of cargo and fourteenth for cargo tonnage among all US ports.